All reservations must be secured by a Visa, MasterCard, or Discover. Reservations require a 1 night, non-refundable deposit for all overnight rentals at the time of reserving the facility. Payment is due from customer at the time of check in for the remaining balance owed for the duration of the stay. Refunds will not be made for customers wishing to shorten their stay after check in. There is a 2 night minimum stay for reservations made between March and October on any week-end, And a 3 night minimum stay for reservations made on Easter, Memorial day, 4th of July, Labor Day, and Major Events. Cancellation fees: Overnight accommodations cancelled prior to 14 days of arrival will result in loss of 1 night deposit. Cancellation of a reservation for the designated holidays and major events will result in the loss of the 2 night deposit required at the time of booking. Cancellation within 14 days or less of arrival date will result in being charged for the entire reservation. Reservations for Easter, Memorial Day, Fourth of July, Labor Day and Major Events cannot be made until January 2 of the year they occur. No reservation can be made in excess of 15 days unless authorized by the Administrative Office and any reservation authorized may require a deposit of up to fifty percent (50%). Reservations made in sequence (same pad for same family) will be considered as on reservation and be charged accordingly. Blocks for tournaments and/or family reunions, etc. will be handled via contract. Monthly reservations at Cypress Bend Park are only available from July 9th – February 28th. Monthly reservations at Cypress Bend Park may only be made by calling 1-800-259-5253 or 318-256-4112. Cypress Bend Park is located on 114 acres of forested land with about 1 mile of shoreline. The overnight accommodations available to you at Cypress Bend include 68 RV campsites with water, sewer and 50, 30, 20 amp electrical hook-ups. You can rent a spot by the night or monthly rates are available from July 9th thru February 28th. Our 10 cabins offer a beautiful waterfront view with air conditioning and heating. 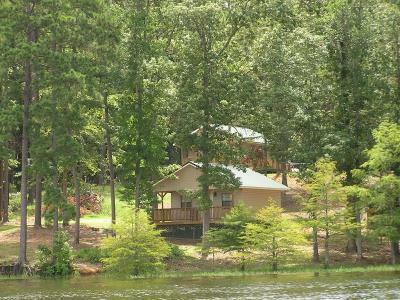 The cabins are fully furnished including dishes, cookware, silverware, linens, microwave, coffee pot and satellite TV. Don’t forget some toiletries and a few snacks and let us worry about the rest. An added bonus to Cypress Bend Park is our newly renovated beach area with easy access to the water. Come and have a relaxing day on the beach while the kids play on our well equipped playground. Set up for your convenience is a volley ball net where you’re sure to always find a good game. Adjoining the beach is our covered Pavilions with picnic tables and restrooms. If you’re looking to just relax and do some fishing, we offer a 6 lane paved boat ramp or you can enjoy our lighted pier, which is handicap accessible. Park gate closes (and is locked) at 9:00 PM until 6:00 AM during daylight savings time. During normal Central Time gates are locked at 8:00 PM until 6:00 AM. Special arrangements can be made for late arrivals of registered guests. An Annual Pass entitles holder and 1 guest (over the age of 12 years) to enter any SRA Recreational Facility for day use. Annual Passes are for individual and / or family use only. Cypress Bend Road is 3 miles South of the junction of Louisiana Highway 6 and Louisiana Highway 191. Cypress Bend is just off of Louisiana Highway 191. Turn off of La 191, between the 28 and 29 mile markers, onto Cypress Bend Road. Go 3 miles on Cypress Bend Road to park entrance. NOTE: At 1.5 miles on Cypress Bend Road you will see the entrance to Cypress Bend Golf Resort; Cypress Bend Park is 1.5 miles past the Resort entrance.